The Silver Predator series from the Royal Canadian Mint is certain to become a favourite with collectors and investors who are attracted by the beauty, purity, and rarity of each coin. 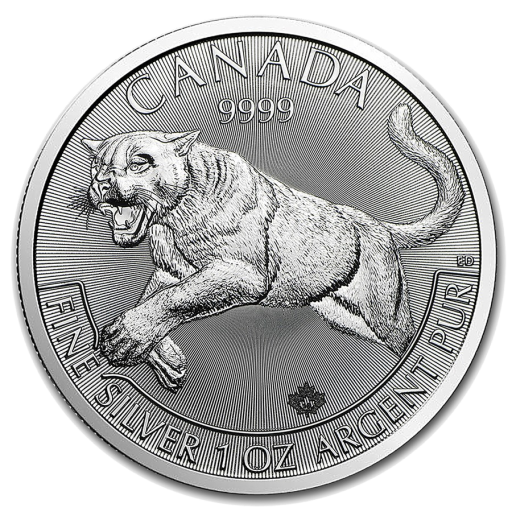 The 2016 Silver Cougar is the first in this highly anticipated series and the coin features one of Canada's most beautiful and powerful predators. The cougar is an elusive creature which is somewhat apt as only 1 million of each coin in the RCM Silver Predator series will be struck. silver-to-go.com is a trusted distributor for the Royal Canadian Mint. We buy the 2016 Silver Predator Cougar in large quantities in order to offer our customers the best prices. Silver coins are considered a very safe investment and all orders are shipped quickly and securely. The Silver Cougar 2016 is available in tubes of 25 or in Monster Boxes of 500.